In a wide bowl, combine the eggs, cream, maple syrup, whiskey, vanilla, and salt. Whisk the custard mixture until smooth. Soak each slice of bread in the custard mixture. Turn each slice 4-5 times in the custard, pressing and releasing gently on the top of the bread to soak up as much custard as possible. You are using the bread's sponge-like structure to pull custard up into the center of the bread. While most recipes call for a stale bread and letting the bread soak in the custard, you can avoid these extra steps by using this 'sponge' technique and moving quickly. Heat a wide skillet (cast iron or non-stick) over medium-high heat. Add the butter. 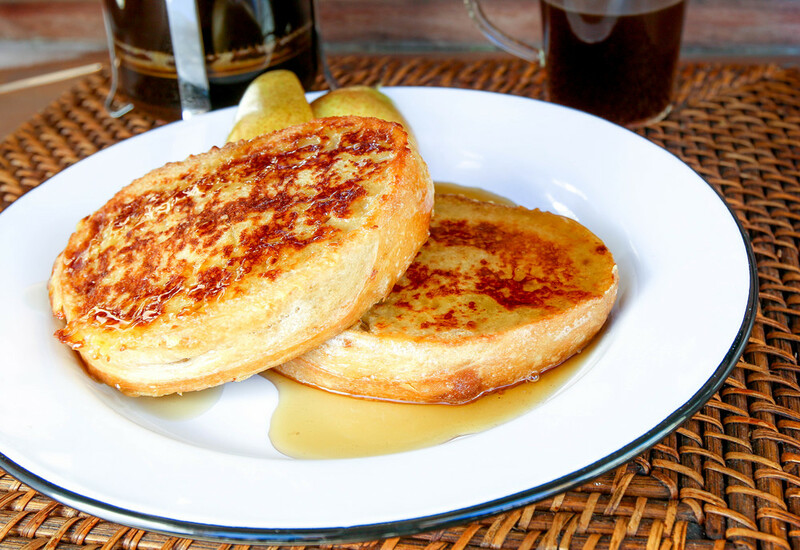 When the butter is melted, and stops bubbling, add the soaked slices of french toast. Cook the bread on the first side for about 3 minutes. Flip, and cook for an additional two minutes. You are looking for the outside of the toasts to get beautifully mottled golden brown, and for the center to just barely set. For the nerds among us, the center should just cross 160 degrees...any hotter and the proteins begin to squeeze out the moisture, resulting in dry toast. Serve immediately with maple syrup, whipped cream, cider syrup, or whatever topping you prefer. A quick trip out to get ingredients can be a big ordeal here in Haiti, especially this time of year. May marks the start of the rainy season. We’ve seen torrential downpours almost daily for several weeks now here in Port-au-Prince. These heavy rains wash out main roads, swell the region’s rivers, overflow the sewers, and cause flash floods which can destroy the fragile homes that line the city’s narrow ravines. Add to this near daily political protests, that bring traffic to a halt with barricades and can shut down whole sections of the city. Recently, two of the three main bridges to the north (on our side of the city) have been out of commission after one collapsed when critical bolts were pilfered. So when I woke up this morning, craving a hearty pancake breakfast, convincing Paul to brave the traffic for butter, milk, or any other breakfast staple was a no-go. This recipe emerged from the bounty of our backyard; toasted coconut from our coconut tree and fresh-as-they-come eggs from Paul’s chickens. These Fresh Coconut Pancakes are absolutely delicious, custardy, and with just the right amount of chew, a perfect start to a rainy day. Buckwheat Buttermilk Pancakes are a healthy, delicious, and easy weekend breakfast with warm malty flavors not usually found in your run of the mill pancakes. The whole buckwheat flour gives these pancakes a rich brown flecked color and hearty nuttiness which pairs beautifully with tangy buttermilk and caramelly maple syrup and molasses. The result is a perfect pancake texture, dark earthy flavor, and enough nutritional goodness to make you feel good about slathering your Buckwheat Buttermilk Pancakes with butter and maple syrup. This recipe is adapted from King Arthur Four's wonderful Whole Grain Baking. Seizing the opportunity to be sweet and let my sick husband sleep in, I decided to get up early and make one of his favorite breakfast treats, cinnamon buns. Despite the best of intentions, I slept in, shoot! A little frantic, I needed a quick turn-around recipe if I was going to deliver. Rather than the traditional yeast variety, I opted for my tried and true 40 Minute Cinnamon Buns. I discovered this recipe a few years ago while surreptitiously reading a magazine article over someone’s shoulder on a plane. They turned the page before I could finish reading the intriguing looking quick cinnamon bun recipe, so I looked the recipe up when I got home, and here they are, delicious, moist and tangy cinnamon buns, ready in 40 minutes or less, no kneading required!